Jay Z’s Tidal wave is about to come crashing down. The nascent paid music streaming service, which the hip-hop mogul bought and re-launched last month to the tune of $56 million, has been maligned in business media for marketing missteps and a product that didn’t seem to fill a particular need on the consumer landscape. “Despite having Jay Z and Madonna and all of those folks on a podium, this is a really rough business, the paid subscription business,” Russ Crupnick, managing partner of streaming industry research firm MusicWatch, told TheWrap. Crupnick said that the product is pretty good, but there’s nothing special about it. 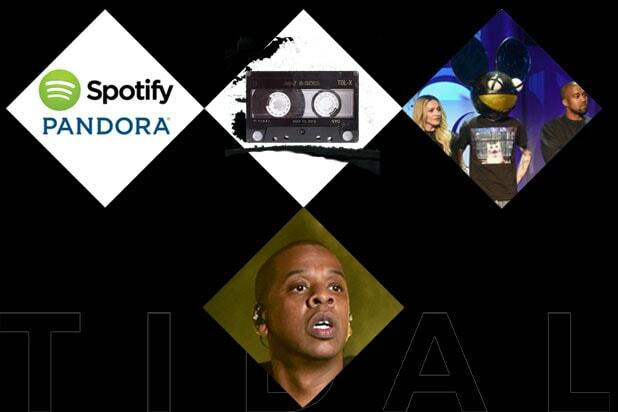 Where Spotify has a free option and allows users to create on-demand playlists with a social element, and Pandora generates free custom radio stations, Tidal is just an app that streams music – for a hefty price. Tidal offers two subscription tiers: a basic membership for $9.99 per month, and a $19.99 membership that offers higher sound quality. But the big lure of Tidal, Jay Z hopes, is its exclusive content. Artists like Taylor Swift pulled their music off rival “freemium” streaming services like Spotify and put it behind Tidal’s paywall, arguing that Tidal will pay them fairly. But as it turns out, people don’t seem to care much about exclusive content – or they find ways to listen without paying. A new song and video Beyonce recorded to commemorate her seventh anniversary with husband Jay Z — “Die With You” — wound up on YouTube the day after it premiered to Tidal subscribers. Speculation has mounted that the power couple will release a joint album on the streaming service, but even that may not be enough to really give Tidal a boost. Tidal did not make any executives available to comment for this story. If listeners don’t care about exclusives, they certainly have no concern for – or even understand – the intricacies of how streaming services pay artists. The main conceit of Tidal’s big, and many say, misguided, launch event in March was the complaint that artists are not paid fairly by music apps like Spotify. Madonna, Kanye West, Usher, Nicki Minaj and other multi-millionaire artists paraded onstage at the March 30 launch event to condemn the other services and promote Tidal as the app that pays. Even as initial backers are starting to keep their distance from Tidal, interim CEO Peter Tonstad stands behind the paid music streaming service’s viability and trumpets Tidal’s future potential. “The whole industry is shifting toward the strategy we have always believed in: that streaming services should be premium subscription models rather than giving away stuff,” Tonstad told the Wall Street Journal on Tuesday. The recently appointed executive, who took over for Andy Chen when the company cleaned house in the middle of April, also has a decidedly rosier view of that widely-panned launch event. Compare that to other “global, well-known artists” who think the optics of their peers onstage were part of the problem. “I think they totally blew it by bringing out a bunch of millionaires and billionaires and propping them up onstage and then having them all complain about not being paid,” Death Cab for Cutie frontman Ben Gibbard told The Daily Beast. “They squandered a really great opportunity of having all of these artists and their PR value and their fan bases explain to consumers why this was something that they should invest in,” the analyst said, adding that he would fire Tidal’s publicity team. But Jay-Z himself is defending the service in impassioned rants on Twitter, and he conscripted Jack White to make personal phone calls to some of the service’s 770,000 subscribers to thank them for signing up. And the service is not subtle about imploring customers who try to quit to rethink their decision. 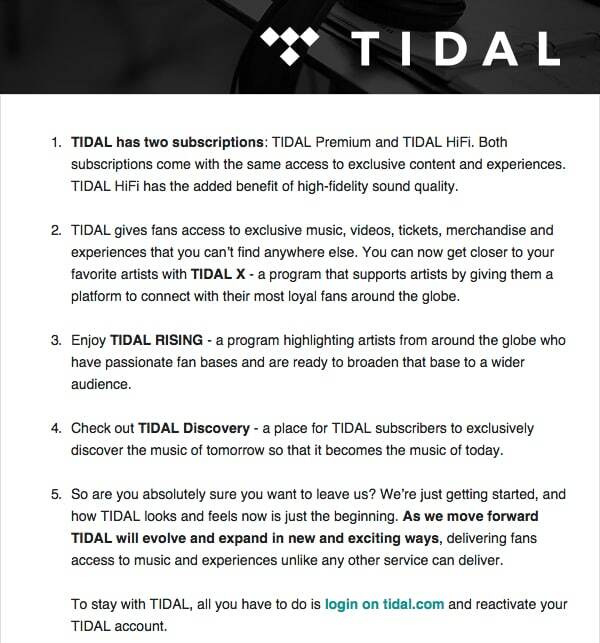 Departing subscribers are sent a “5 reasons why you should stay with TIDAL” email, which consist mainly of vague promises of features to come. Also Read: Show Them The Money: Will Jay Z's New Streaming Service Tidal Pay Out? All of this paints a picture of a young company with a decent but unnecessary product and terrible PR team, Crupnick says. Media reports have been writing Tidal’s obit since before the service launched on March 30, but Crupnick believes it will be the consumer – influenced by, hopefully, improved marketing – who ultimately decide Tidal’s fate.